First light. Too inquisitive to roll over in my down bag and get some more sleep I tiptoed, head to foot in merino, across the wooden floor, peaked out of the gingham curtains and then had to lean down to pick my jaw off the floor. We were in the Sunnmore Alps. Our guide Rolf was also up and in broken English asked me if I'd seen Slogen yet, probably the most famous peak in this area and a definite summit for baggers. 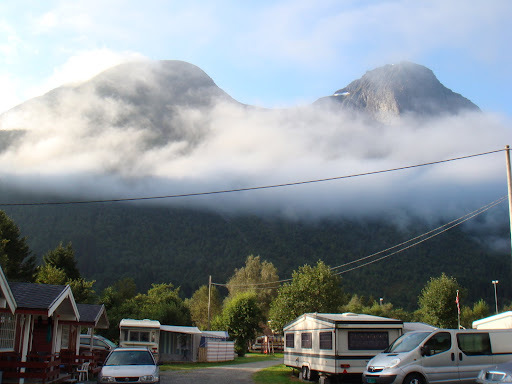 We stepped outside into the crisp morning air and walked past the row of hyttes and caravans. Then he stopped and pointed out across to the horizon and there was Slogen's angry, shark fin silhouette, purple in the morning light. "Slogen" he cooed which sounded like "Shloogen". Back in the hytte everyone was getting up and while Rolf laid a table of bacon, eggs, tea, coffee, bread, meat and cheese everyone else packed and re-packed rucksacks and umm'd and ahh'd about which socks to wear. Our party of derring doers was split into two groups. The more experienced climbers were off early to catch a ferry to the base of Slogen while some of us had to be content with a tamer but no less high peak called Skarasalen which afforded better views without having to pay an exposure premium. 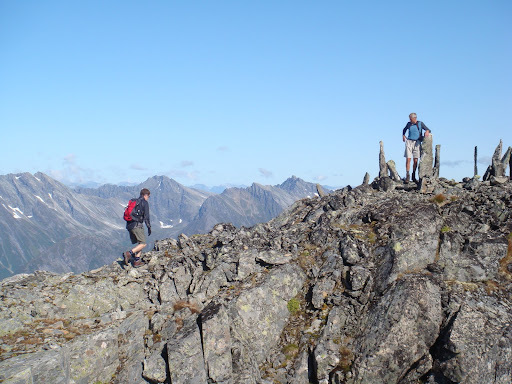 We had decided beforehand that Slogen probably wasn't the best mountain for my M to start on in the Sunnmore Alps. 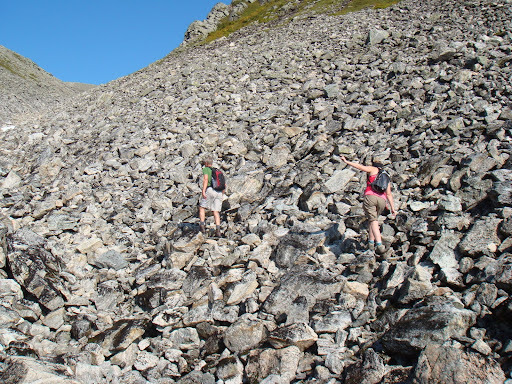 Slogen has some serious 'airy' bits and some technical scrambling towards the narrow summit. Not wanting to leave M on her own I'd agreed to go with her today and we'd build up to Slogen next season together. Rolf was going to be our guide up Skarasalen and he knew enough English and an immense amount about the local mountains to keep us safe and entertained. The Slogen party departed first and we wished them luck and agreed to keep in contact and try and text when we both summited which should be around lunchtime. M layered up open sandwiches of ham and cheese and we took some Blueberry Bixits and a few Nuun tablets to keep us going. Rolf drove us to the trail head up one of the surrounding valleys and 15 minutes later we were off, stripping layers almost as soon as we started as the day warmed up. Within half an hour we were above the tree line and we took a few breathers as M was still in the final throes of a cold and didn't seem to be able to get going properly. The dirt tracks through the heather gave way to massive fields of scree lining both sides of a narrow valley. You could hear the snow melt water gushing downhill below the rocks and pretty soon we were refilling our bottles with ice cold pure water from just below the first snow field. It was obvious that Rolf was having to 'go slow' today in order for us not to leave M behind. What made it worse for M is that Rolf is 70 years old next year and only 7 months post-op after having his meniscus removed from his right knee (we compared scars!) Bless her, M was trying but she just couldn't find 2nd gear, it was like the clutch was in. In her defence Rolf is the fittest, strongest 69 year old I have ever met. The guy has a six-pack for christ sakes! 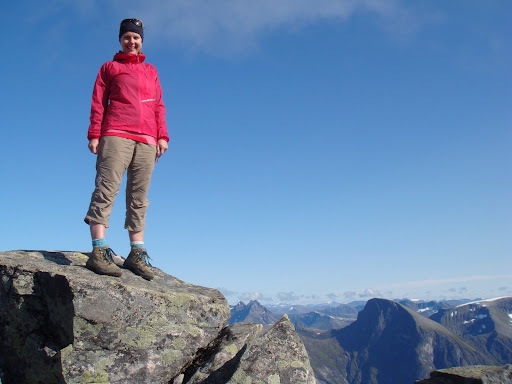 We made it to the col for elevenses and as we walked over the ridge we both apologised to Rolf as we uncontrollably swore at the stunning view of the Hjorundfjorden and surrounding mountains. The colour of the fjord was deep aquamarine and across the way we could see Slogen and wondered how our friends were doing on the impossibly steep looking sides. After a quick break we headed east towards the summit, tiny steps in the steep, loose scree following a zigzag hint of a path. It was like a moonscape, nothing green grows here, just rocks with a slight 5 o'clock shadow of lichen. Soon we hit the main snow field and could see the summit cairns which pulled at us like tractor beams. The final approach to the summit was were we encountered the biggest rocks and some minor scrambling was required to crest the final ridge and then we were there. We staggered about a bit at first. The full 360 degree vista was truly awesome. Rolf said it was probably the clearest day of the season and started to point out the surrounding mountains giving us details about past exploits, heights and meanings behind their names. We donned more layers in the chilly breeze and set about writing our names in the summit logbook and scouring the summit of Slogen across the fjord with a pair of tiny binoculars to try and catch a glimpse of the other group. We sent them a text to say we had reached our 1542m summit and got down to photographing ourselves in goofy summit poses and the view. Rolf even clambered up one of the eight foot high cairns that perch precariously on the edge of the small summit ledge. We nestled into the circular stone shelter and scoffed our lunch, washing it down with coffee and Nuun. 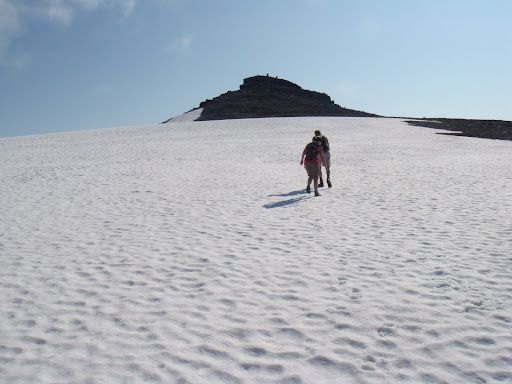 It was time to head home so we strapped up the boots and picked our way carefully back down the rocky approach. Then we got a text from the other group, they had summited safely but where heading down straight away in order to catch a ferry back across the fjord. On the way down we took a slight detour and following Rolf we walked across a narrow ridge to a solid rock buttress with 800m high overhanging rock faces. It gave spectacular views back up the mountain to the summit and the sheer rock fortress that made up the northeren face. M decided she wanted to have a peek over the edge so Rolf held onto her and they peered over the edge together. I could see M's hands clenched tight into little fists as she fought her default reaction to come away from the chasm. When she turned round you could see the buzz of adrenaline in her eyes. We made it back down safely after learning how to 'ski' down the patches of snow on the soles of our boots. We vowed to get a Snow Claw because all we wanted to do was glissade our way down the gully although the braking mechanism here would have been a large boulder to the face. After 7 tiring hours we were back at the car. We thanked Rolf for the amazing day and headed back to the hytte for fresh mountain trout fried in butter and a mountain of potatoes followed by chocolate pudding and vanilla sauce. Well, you've got to replace the calories! Its like Scotland on steroids. What wonderful view awaits you next weekend? Thanks for watching guys! Yes I will be out and about this weekend but the exact location has yet to be finalised. I can't believe how lucky we've been with the weather in The City of Rain. I've gotten a slight tan for heaven's sake!